This weekend brought a welcome surprise with the discovery of 2 beers I have been wanting to try. Yes this is a whisky blog but beer does have an very close relationship to whisky. Furthermore I also recently posted some information about Ola Dubh ('Black Oil') which is a Dark Ale aged in Highland Park Whisky Casks. 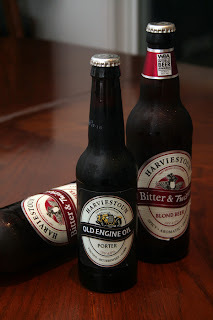 Unfortunately no I did not find the Ola Dubh but I did find Old Engine Oil by Harviestoun Brewery, the Ale taken to be then aged in the whisky casks. Also sitting next to it on the shelf was the Bitter and Twisted Blond so I could not resist the urge to also make the purchase. I had spoken about Ola Dubh only being available in the US according to the website but it does appear all the other expressions by Harviestoun Brewery are here already. The lable says imported by Australia Beer Connoisseurs which means Coles and hence why I found these in a Vintage Cellars. The staff knew nothing about the beers at all and said they were failing to sell any simply due to how the beers were named (also the same reason they had not tasted the beers themselves). Old Engine Oil - 6% / 330ml. Porter Ale style. Old Engine Oil is a rather extreme name for a beer but once you have tasted it then it really makes sense. Classed as a Porter Ale it has a lot of resemblance colour wise to a Stout but certainly not as thick. Most Porters I have had have been bitter, bad, and terrible memorable for the wrong reasons. This is not one of those bad experiences. On opening the bottle and pouring into a glass there is a real vicious appearance to it and the bubbles are slightly greasy. Super dark in colour one can easily mistake it for a glass of Coke. The bubble are large and very long lasting. The nose is quiet sweet and on tasting unexpectedly pleasant and refreshing. The texture over the tongue is smooth, sticky / greasy yet has a high carbonation almost popping effect at the same time. Only a slight bitterness remains but not enough not to go another and then another glass. For an Aussie you could closely associate this with a Tooheys Old owned by Lion Nathan rather than mistaking it for Guinness. Due to the sweetness I can really see how ageing this in oak would bring put some amazing flavours. 7 out of 7 for Old Engine Oil. Bitter and Twisted - 4.2% / 500ml. Blond Beer style. Don't be fooled by the name and even more so don't be fooled by it's classification. It is not as bitter as it sounds and no it is not a Blond (at least not to Aussie standards). Dark amber in colour one would be expecting light yellows, this is certainly a heavy beer. Heavy in taste, heavy in appearance, and heavy to swallow. Very fruity on the nose with a very strong hop influence though not so to make it overly bitter. As I have read the hops are added at various stages to ensure the bitterness is not strong in the end product. It also accounts for the slight zesty spike zesty lemony spike barely found on the finish (note there is not actual lemon in the brew). I found this beer confused and problematic to drink. Being unique is not always a good thing. 4 out of 7 for Bitter and Twisted. Overall the experience was excellent and I really enjoyed having Old Engine Oil especially prior to trying the Ola Dubh. Australia has a big import industry so I am sure to find Ola Dubh at some stage soon.